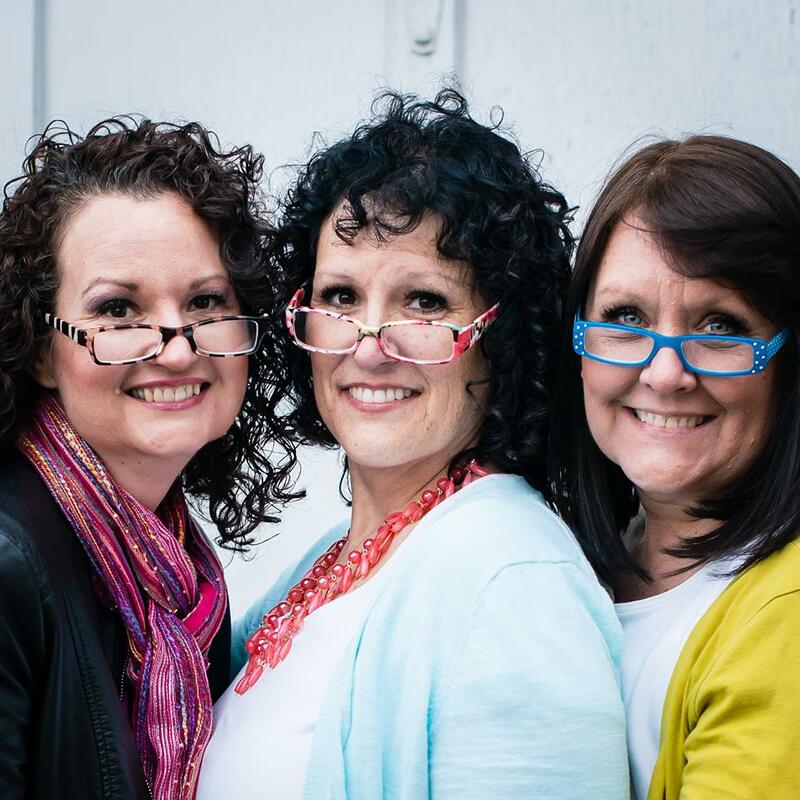 Do you love surprises? Yes? 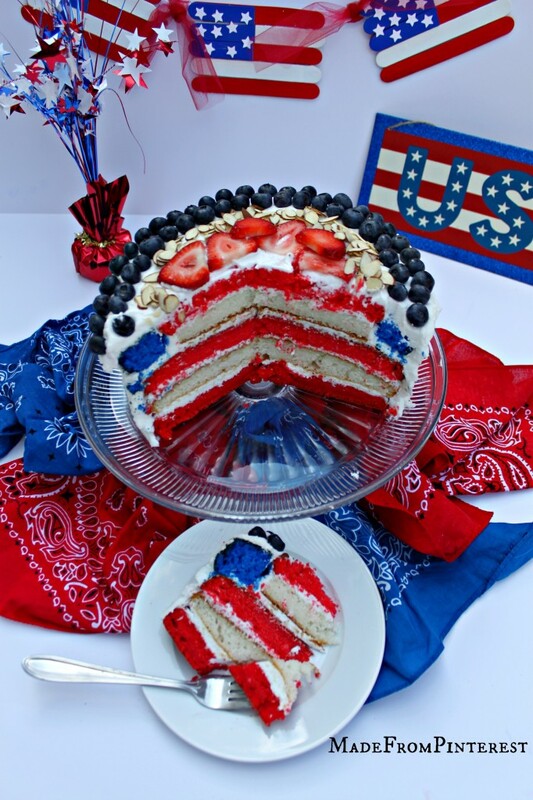 Then you will love this idea for cake. Surprise cakes are pretty popular right now. With blueberries, almonds and strawberries on top, you get a little hint that there might be something special on the inside. Assembling this cake is easier than I would have thought. I began with four boxes of vanilla cake mix. A cake with this many layers take a ton of frosting and that would have meant purchasing several tubs of the commercial stuff. So I pulled out my favorite recipe for frosting and doubled it. 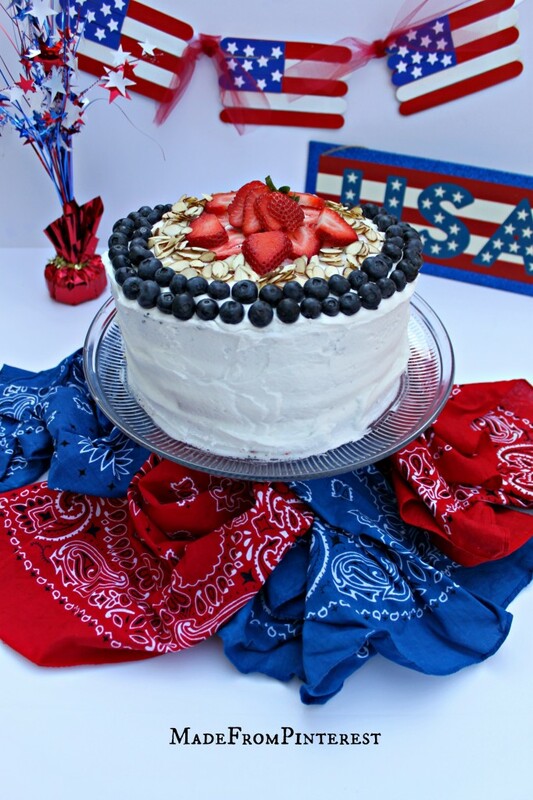 I used almond extract in mine for this cake and it was delicious with the berries. I live near several of our nation’s historical sites and living in an area so rich in our nation’s history, you can’t help but be bitten by the history bug. 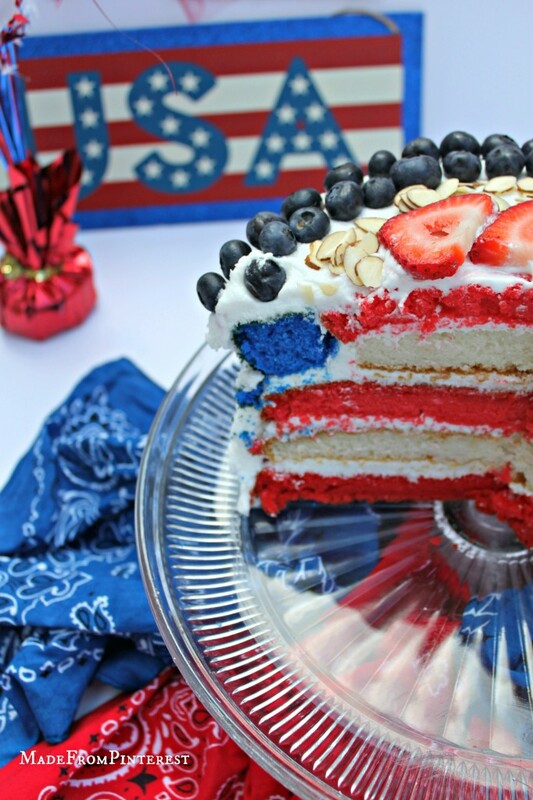 I love the good old red, white and blue. Here are a few flag snippets for you: There are 13 stripes representing the 13 original colonies. 50 stars for the fifty states. Some say red is for valor and zeal, white for hope and purity and blue for loyalty and justice. 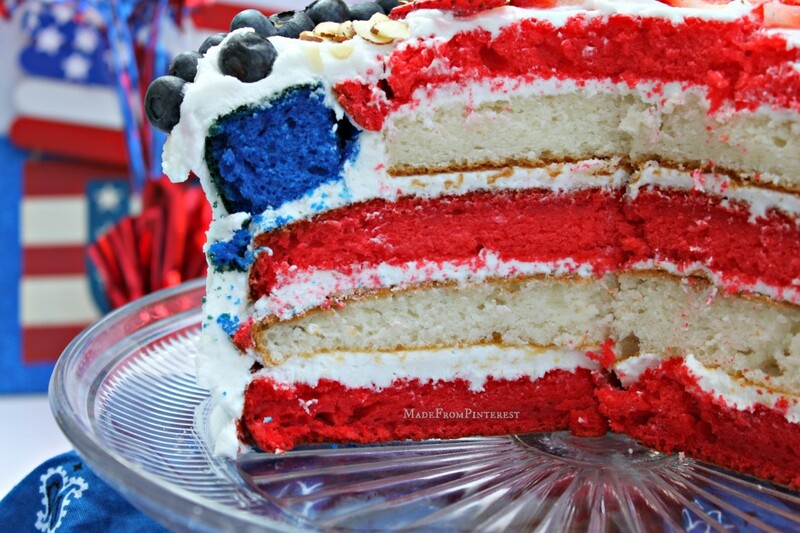 Legend has it Washington interpreted the colors something like this: “We take the stars from Heaven, the red from our mother country, separating it by white stripes, thus showing that we have separated from her, and the white stripes shall go down to posterity representing Liberty.”. 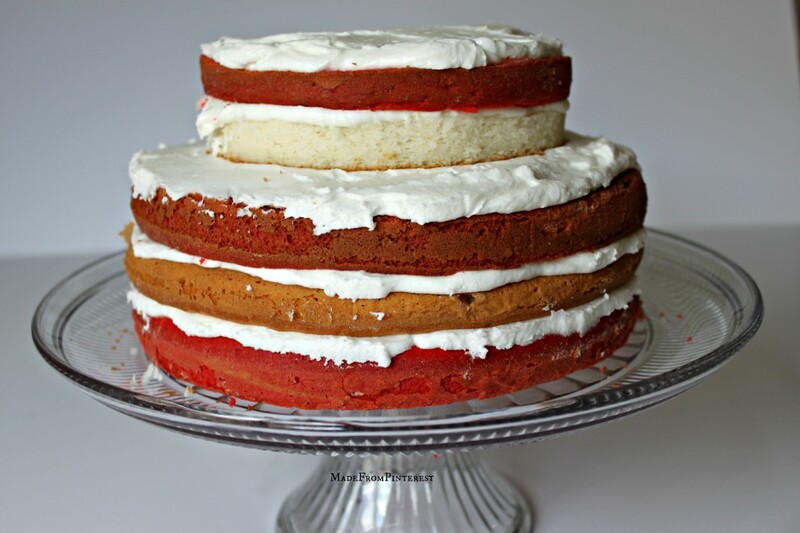 To make this cake I baked (2) red layers, (1) white and (1) blue using one box of cake mix for each layer. I colored them using icing gel food coloring. Then I leveled the tops. Next, I cut the red and white layers in half to create enough stripes. Leave the blue layer double height. 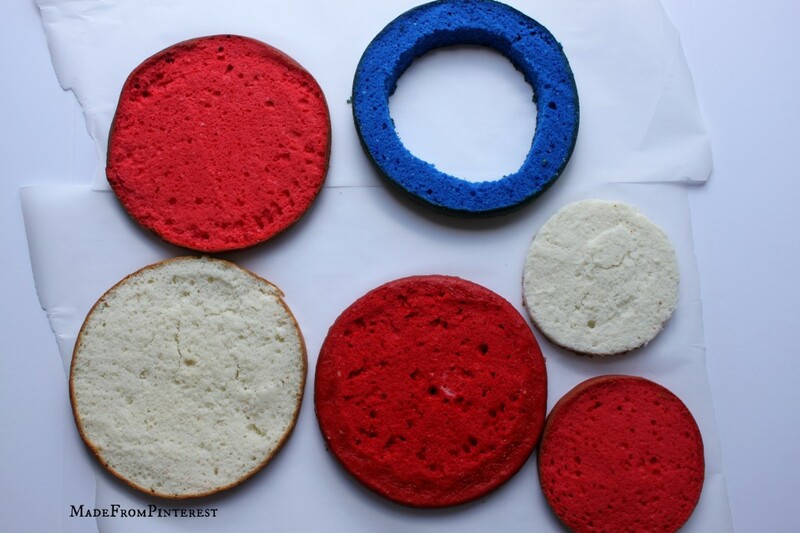 I cut a 6 inch circle out of (1) layer each of red, white and the blue. (Next time I will do a 5 inch circle. I wish the blue was a little bigger.) It is important that you trim the samll red and white circles a bit smaller so that the blue ring can fit around those two circles. This is very important or your blue ring will break and fall off. It is easier to fix if it is too small than if it is too big. Any extra space can be filled in with frosting. You will have left over one blue center circle and a white and red ring. I cut those in squares and put them in the freezer to make parfait out of at a later date. Before assembling the cake I wrapped each layer in plastic wrap and put them in the freezer for about an hour. This makes the layers easier to assemble without them falling apart. Frost the top of the red layer first. Then again with the white and red. Top with the small white and then small red. 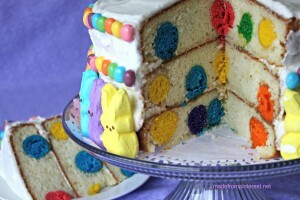 Next, I added the blue ring and frosted the remainder of the cake. Next time I will put the blue ring on first and carefully insert the small red and white layer. Don’t forget not to stretch the blue ring to fit around the small red and white layers. Trim them to fit neatly inside or the ring will break apart. Can you tell I had a little trouble with this? Thanks to the Sugar Turntable for instructions and inspiration. This cake rocks! For another cake idea with a surprise on the inside try our Polka Dot Cake!